NYC, 02/21/2019, 1:00PM. Ashes to Ashes: The Songs of David Bowie, 1976-2016. 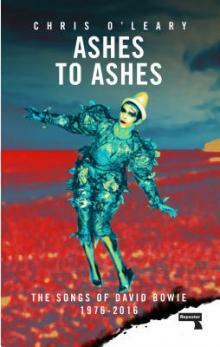 Chris O'Leary's Ashes to Ashes covers every single Bowie song, whether it was sung, written, or produced by him, from 1976, when he first recorded with Iggy Pop on "The Idiot," to his last masterpiece "Blackstar," released just days before his death in 2016. Each song is annotated in depth and explored in essays that touch upon the song's creation, production, influences and impact. It hits everything from "Heroes" to the Labyrinth soundtrack, from his 1985 camp duet with Mick Jagger on "Dancing In the Street" to "Where Are We Now," his comeback single in 2013. Along the way we encounter a vast cast of characters, weaving in and out of Bowie's life and his music: Brian Eno, John Cale, Nile Rodgers, Lou Reed, Freddie Mercury, Scott Walker, Marc Bolan, Arcade Fire, John Lennon, Mickey Rourke, Gary Oldman, Iman, Hanif Kureishi, Julien Temple, Giorgio Moroder, Neil Young and many others. And we range across the globe from Bowie's years in divided Berlin to his "exile" years in Switzerland through his final years as a New Yorker, recording within walking distance of his home. Chris O’Leary is a writer based in Massachusetts. He has written for Pitchfork, Slate, New York, Mojo, and Billboard. He is the author Rebel Rebel: All the Songs of David Bowie From '64 to '76 (2015) and creator of the acclaimed Bowie blog ‘Pushing Ahead of the Dame’, listed as one of Time's "Best Blogs of 2011".